This guest post was written by Morgan McMichen. Morgan is a graduate student at the Seton Hall School of Diplomacy and International Relations. Her specializations are in International Organizations and Global Negotiations and Conflict Management. Morgan’s interests are the function of international institutions in a global society and negotiation as a means of deterring conflict among multinational actors. This blog is the result of a policy memo written in May of 2017 by Morgan McMichen and Ryan Cascardo, a recent graduate of the Seton Hall School of Diplomacy and International Relations. This is the second blog post in the Center’s Refugee Crisis Series. 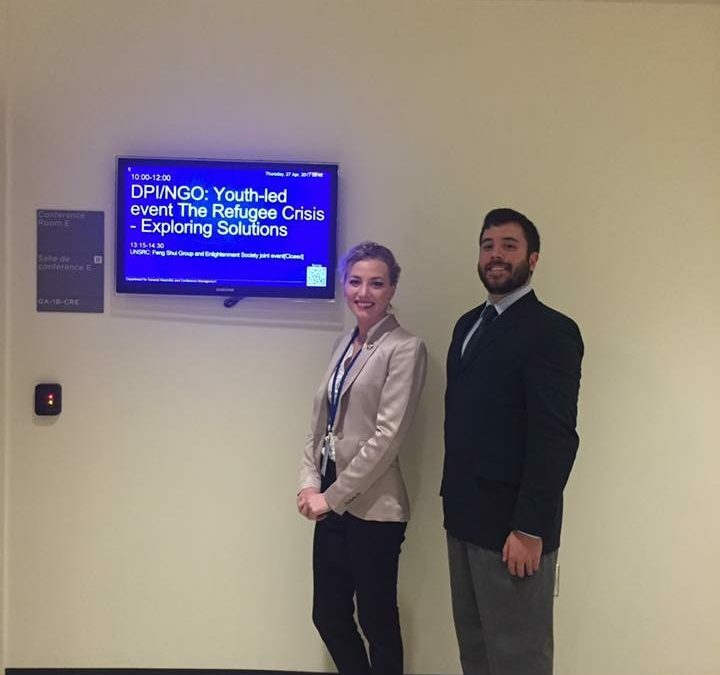 This series of posts presents research conducted by Seton Hall students and presented at United Nations Headquarters. The world is facing the largest refugee crisis since World War II, with the primary source of Middle Eastern refugees and displaced persons migrating from or within Syria. With so many people displaced, the Middle East has become even more unstable, in addition to terror threats and other forms of instability. The Syrian government headed by Bashar Al-Assad is the primary cause for so much migration from Syria as well as internal displacement. Since the onset of the crisis in mid-2011, Syria’s neighboring states of Turkey and Jordan have been the primary locations to which refugees flee, with approximately 90% of Syrian refugees going to each neighboring nation. Though populism with a strong nationalist and xenophobic sentiment is sweeping over many European nations, places like Germany and Sweden are servings as progressive and effective examples of how to manage the crisis. Previously the Obama Administration had admitted close to 40,000 Muslim refugees from the Middle East and Africa in FY 2016. Some seeking sanctuary in the United States are granted asylum, however with changing policies in refugee acceptance and immigration from the Middle East, the percentage of those accepted into the US is steadily declining from 2016. Past efforts from the United States to mitigate the refugee crisis in Syria have been largely ineffective for a number of reasons. Due to the burden of displaced people fleeing to other Middle Eastern nations, as well as Europe, a new security threat has emerged in the region. Iran, one of the biggest aggressors against the US and a prominent enemy in the region as well as Russia, continue to back the Assad regime. The US should oppose Assad, Iran, and Russia to alleviate the refugee crisis as well as to combat ISIS. In the interest of minimizing direct US involvement in the affair, three courses of non-interventionist action will be presented in this blog. They are: allowing more Syrian refugees into the United States after thorough vetting, offering support for NGOs – especially those that operate within Syria and the Middle East to aid refugees, and giving more foreign aid to Middle Eastern allies that take in refugees from Syria. A great number of issues exist surrounding the Syrian refugee crisis both related to global security as well as humanitarian affairs. However, the most pressing issues for the United States are matters related to security. The moratorium on US acceptance of refugees by President Trump is largely due to a concern for a potential security threat coming from Syria and the surrounding area. Recently, matters have become more complicated to due to a shift in US foreign policy of non-entanglement in the Syrian Civil War. This was done when President Trump ordered a missile strike against Syrian military facilities on April 6, 2017. This action has the potential to lead to a successful US involvement in Syria, either directly or by proxy; or there could be unforeseen negative consequences. Regardless of past actions or inaction, the US now has the responsibility to engage in Syria to alleviate the refugee crisis and its cause(s). Accept more refugees from Syria into the United States – This action would require executive oversight and approval to halt the moratorium on applications from refugees from Syria to enter the US. While this prescription contrasts with the current state of affairs regarding refugees, it is important to consider the president’s unilateral act of aggression in Syria likely contributing to increased hostility within Syria; and a potential increase in the evacuation of its people. Offer financial support for those Non-Governmental Organizations operating within Syria to alleviate the refugee crisis – Because the United States current foreign policy does not allow for increased spending for the Department of State, nor the United Nations the United States can still contribute to the aid of the displaced Syrian populace. These organizations include, but are not limited to, International Rescue Committee, World Vision, and Mercy Corps. A strong show of support of such organizations will also demonstrate a sense of commitment of constructive involvement in Syria to our Middle Eastern allies. Furthermore, it will allow Syrians to remain in their homeland. Give foreign aid to Jordan, Turkey, and other allies which admit refugees from Syria – With Turkey and Jordan bearing the brunt of the refugee crisis at their doorsteps, it would be a prudent strategy if the United States were to provide financial assistance for matters related to those refugees in the Middle East. Jordan especially, is a key political ally for the United States in the region, and aiding them financially would indirectly increase security for US interests within that geographic area. However, if the US were to support a country such as Turkey, it could be viewed as support for the increasingly repressive regime of President Erdogan. Given the risks associated with policy options 1 and 3, we recommend the United States execute a policy consistent with policy option 2: Offer financial aid for NGOs operating within Syria. This would allow for the United States to maintain a minimal level of direct involvement involving military or any other type of personnel being sent to Syria. The support for such humanitarian and crisis relief organizations would be an excellent demonstration of goodwill towards the US’ Middle Eastern allies, as well as those in Europe, who may feel overburdened by an increasing influx of refugees from Syria. Furthermore, this option would minimize any risks associated with persons from Syria migrating to the US. A recent Pew survey in late 2016 showed that 51% of the American public believed it was not the obligation of the US to take in more refugees. Therefore, we believe both security analysts, as well as the American public, would be most in favor of increased US funding for NGOs leading humanitarian operations within Syria.